My wife and I just got our CAG home and settled in for the evening. Her name was rags or ragtime (the previous owners liked that type of music) we have renamed her Scarlet. We rescued/adopted a beautiful 26year old. Poor girl lived happily with her female owner for 25 years then the lady passed away. Scarlet was then placed with the controller of the estate for a few months then forwarded to a friend of that lady. The friend hold on to her for 6 months and seemed to give her a pretty good home. Scarlet and the lady who we got her from had a very good relationship, Scarlet would allow her to scoop her up out of the cage and cuddle in her hands and neck. Scarlet is a bit shy of us at the moment, but with her last year being so unstable that is completely understandable. We are planning on giving her some time to adjust, she is placed close to where the family gathers so she can be a part of the family but aside from talking to her we are giving her space. Any info or techniques to make her transition smoother and less stressful would be extremely appreciated. You are doing all the right things, going at her pace, talking to her and giving her time to settle in. You can also try offering her treats and see how she responds. Just let her guide you. I don't know how vocal she is. With Chyloe, she will tell you what she wants or doesn't want. That would be helpful. If Scarlet doesn't tell you, watch her body language and go at her pace. We are definitely going at her pace. I tried to offer her a couple almonds this morning as a breakfast treat and she did show some interest, stepped forward and leaned towards me but decided they were not as important as keeping her distance for the moment. It's ok with me because to be honest I wasn't sure if she was looking at the almond or my fingers so I didn't push it. I dropped two of them into her treat bowl and went about getting ready for work. My daughter was home alone with her today and reported that she was telling the cats "it's ok" and telling the dogs to "sit down"
Her previous owner said that to her when she would take her out of her cage. I'm heading home in a few minutes and will give her another opportunity to enjoy some food from my hand. Sounds like Scarlet is settling in. What a joy that first time she takes food from your hand... I must tattle on myself, it was a small piece of pizza crust but she was so gentle and interested. And her speech...! It's amazing to hear her speak so clearly and in a perfect human tone.. actually scared my daughter for a moment the first time she said "it's ok" sounded exactly like the lady we got her from. My daughter was in the next room and thought someone was in the house...she was home alone. Haha. Only been 2 days and what an experience already. Chy loves pizza crust too. It can be confusing when the bird sounds exactly like someone in the house. Our first grey only used my husband's voice. Chyloe usually uses my voice. We have a funny story about having our driveway repaved. There was a woman as part of the crew. She asked to use the powder room so my husband showed her where it was then went to stand at the front door to watch the action in the driveway. While she was in there, our first grey was talking using husband's voice. When the woman came out, she asked hubby if he was talking to her while she was in the bathroom. He had to take her to see Max so she wouldn't think badly of him. Scarlett hasn't picked up our voices yet, but she loves telling the dogs to sit down and they usually do it..its great! We are trying to encourage her to tell them good dog when they listen to her...that may take a while but we always tell them in an excited voice hoping she's listening. She has also started telling then to lay down, It's not extremely clear yet but she's getting it. 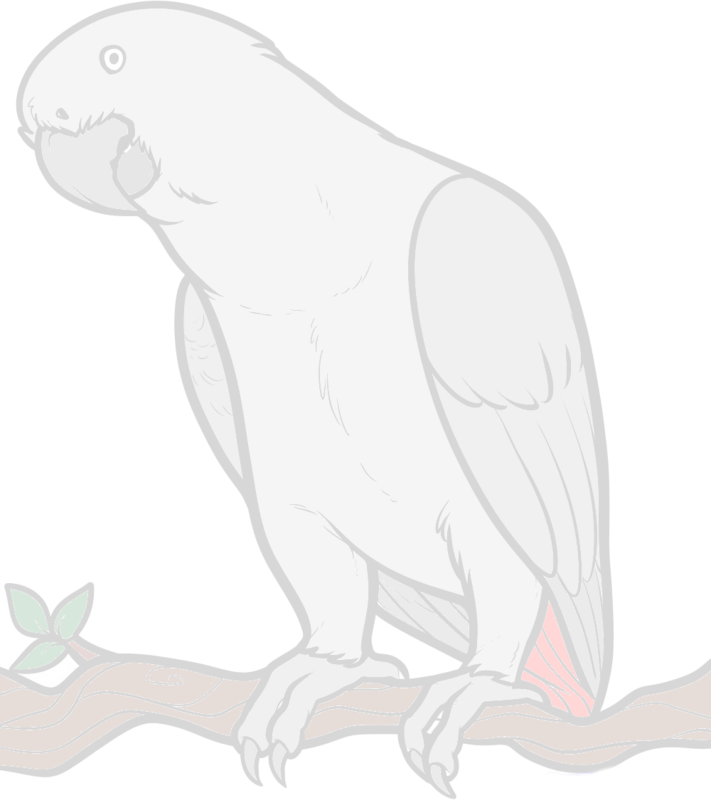 many of the rehomed parrots are. You are going to have SO MUCH FUN! She wasn't what you'd call refined; she wasn't what you'd call unrefined. Your are correct, she talks up a storm when she thinks nobody is listening. She must feel comfortable because I've heard her say 4 or 5 things that the previous owner never mentioned she says and it isn't thinks we say...Well we didn't used to say them...she has obviously taught us a few things because now we always say bye bye as we head out the door and hello as we enter and where'd you go when we leave the room and many more things strictly for her. No she doesn't say her name for some reason, we use her new name very often but it sure she is picking up on it being her name. We say her name after we say hello, bye bye, good night etc. but not sure how to have her realize that's her name we are saying. I suppose she'll get it sooner or later, shes a darn genius. She has alot to get used to, 3 children 14 and up, a few dogs and a few more cats..the lizards, tortoise and fish don't seem to catch her attention much. We are working on having her call the cats "Here kittie kittie" though they don't listen. We say it whenever we see them around her cage hoping she will cat on that the are the kitties.. luckly the cats don't seem to be too interested in Scarlett, though we don't take any chances of course. We are always close when her cage is open. Hi members, my husband and I have a 30 yr old CAG named Alex but 5 years ago Alex laid an egg, so we know it's a pretty girl now. I retired 2 years ago so I'm here with her a lot more. Alex has always had screeching fits but they seem to be worse lately. We've tried paying more attention to her, letting her out of cage more, even getting her a new toy. My question is do they have hormonal cycles they go through and this is a phase or is something wrong with her? Thanks for any advice. I end up covering her cage when screaming. I hate to keep doing that. Hello Ginnymc and welcome to the forum. Yes they can get broody, some more than others. My 23 year old female has never laid an egg but she does get broody. If Alex has always had these screeching fits it could be due to something else - is there any pattern to them such as time of day or in response to something?